Download "Math 143 - College Algebra (Online)"
1 Math College Algebra (Online) 3 Credits Term: Instructor: Spring 2010 Ken Floyd (208) Office Location: Office Hours: Shields 206E 1-2 PM, M - F 10 AM - Noon Saturday CSI Bookstore: (208) or (208) ; Toll free in ID and NV at , ext FAX: (208) Course Description: This course includes fundamental concepts of Algebra; equations and inequalities; functions and graphs; polynomial, rational, exponential and logarithmic functions; systems of equations and inequalities; conics; the Binomial Theorem. Credit hours not granted in both MATH 143 and MATH Prerequisite: Math 108 (Intermediate Algebra) or its equivalent with C grade or higher; or COMPASS Algebra (not Pre- Algebra) score of 62 or higher. The prerequisite will be strictly enforced. 3. Required Hardware/Software: You will need to access the internet and use as well as the WebAssign site provided by the publisher of the textbook. Currently only the PC computer platform is supported by WebAssign. 4. Textbook and Supplies: A. 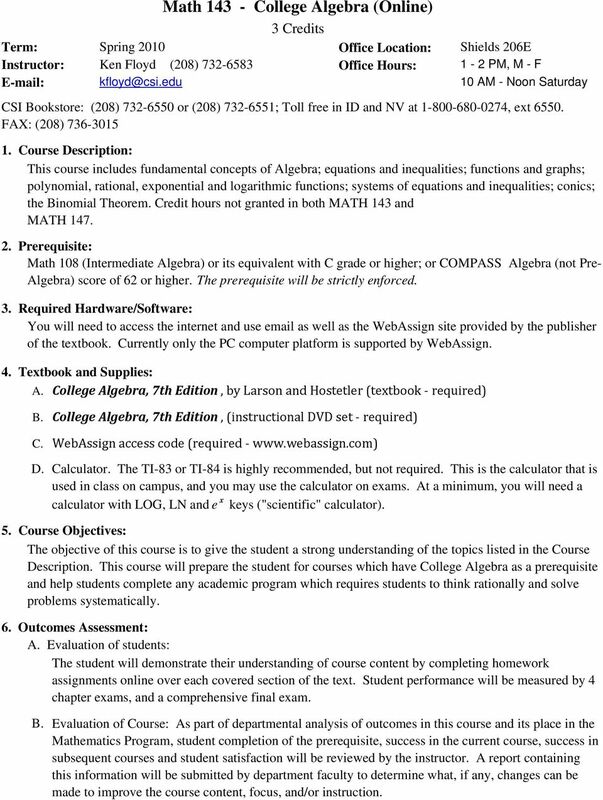 College Algebra, 7th Edition, by Larson and Hostetler (textbook required) College Algebra, 7th Edition, (instructional DVD set required) C. WebAssign access code (required D. Calculator. The TI-83 or TI-84 is highly recommended, but not required. This is the calculator that is used in class on campus, and you may use the calculator on exams. At a minimum, you will need a calculator with LOG, LN and e x keys ("scientific" calculator). 5. Course Objectives: The objective of this course is to give the student a strong understanding of the topics listed in the Course Description. This course will prepare the student for courses which have College Algebra as a prerequisite and help students complete any academic program which requires students to think rationally and solve problems systematically. 6. Outcomes Assessment: A. Evaluation of students: The student will demonstrate their understanding of course content by completing homework assignments online over each covered section of the text. Student performance will be measured by 4 chapter exams, and a comprehensive final exam. Evaluation of Course: As part of departmental analysis of outcomes in this course and its place in the Mathematics Program, student completion of the prerequisite, success in the current course, success in subsequent courses and student satisfaction will be reviewed by the instructor. A report containing this information will be submitted by department faculty to determine what, if any, changes can be made to improve the course content, focus, and/or instruction. 2 7. Policies and Procedures: A. Consistent effort is critical for your success. Many students severely underestimate the amount of effort required to pass College Algebra. You should plan to spend at least 9 hours per week on this class, probably more. me for help if you get stuck, so that you can keep on pace. C. D. E. Assignments: For each section that we cover, you should do the following: Read the section lesson in the textbook. Watch the instructional video on the DVD. Complete the assigned problems using WebAssign. Some solutions to example problems may be posted on the class web page from time to time. Exams: There will be 4 chapter exams and a comprehensive Final Exam. 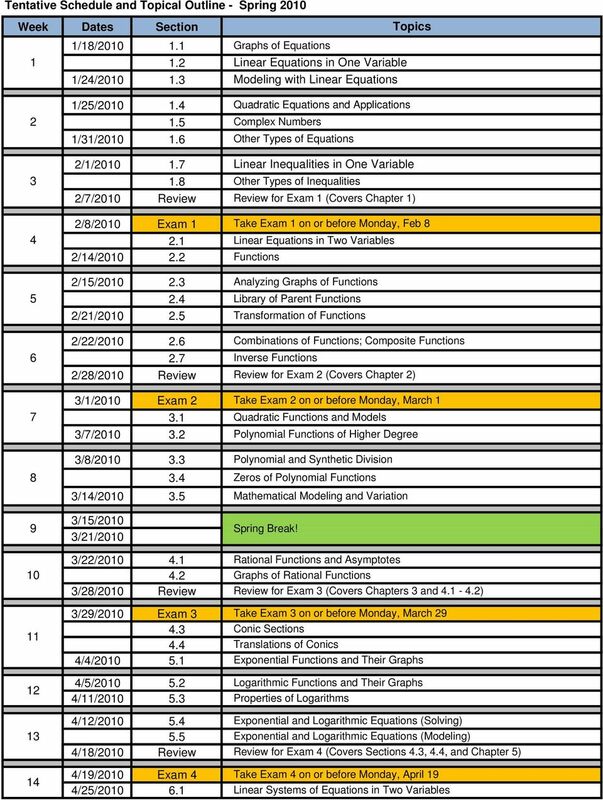 These are paper/pencil exams that must be taken in a proctored testing environment. If you live near CSI or one of CSI's outreach centers, you should take the exam there. Otherwise, you must arrange to have the exams proctored at some other approve location. It is CSI policy that students who cannot take exams at CSI or one of its outreach centers must pay any proctoring and postage fees. Please contact me early on if you can't take the exam at CSI or an outreach center. I reserve the right to change testing accommodations if I feel it is necessary to protect the integrity of the testing process. Please read the behavioral policy on Honesty starting on page 16 of the current CSI Catalog. Any violation of the policy will be dealt with severely including, but not limited to, being dismissed from th class, given a grade of "F" for the course, and/or being expelled from CSI. Information regarding student Behavior Policies can be found on pages 16 and 17 of the CSI catalog. is the primary means of written communication with all CSI students. Students automatically get a CSI account when they register for courses. Messages from instructors and various CSI offices will be sent to the students' CSI Eagl accounts (NOT their personal accounts). It is the student's responsibility to check their CSI account regularly at eagl .csi.edu. 8. Grading: Homework 15% 90% Chapter exams: 15% (each) 80% Final Exam: 25% 70% 60% A B C D NOTES: 1. All students must pass (at least 60%) the comprehensive Final Exam in order to receive a grade of A, B, or C in the course. 2. Students who wish to drop the course must fill out a drop form and turn it in to the records office. CSI no longer allows instructors to drop students with a "W". Students who do not drop by April 12 will receive a grade of "F". 3 9. On-line Course Evaluation: Students are strongly encouraged to complete evaluations at the end of the course. Evaluations are very important to assist the teaching staff to continually improve the course. Evaluations are available online at Evaluations are open two weeks prior to the end of the course through the last day of the course. Evaluations are anonymous, and should only take a few minutes. Your honest feedback is greatly appreciated! 10. Tentative Exam Schedule: A. Exam 1: Feb 8; Exam 2: March 1; Exam 3: March 29; Exam 4: April 19. 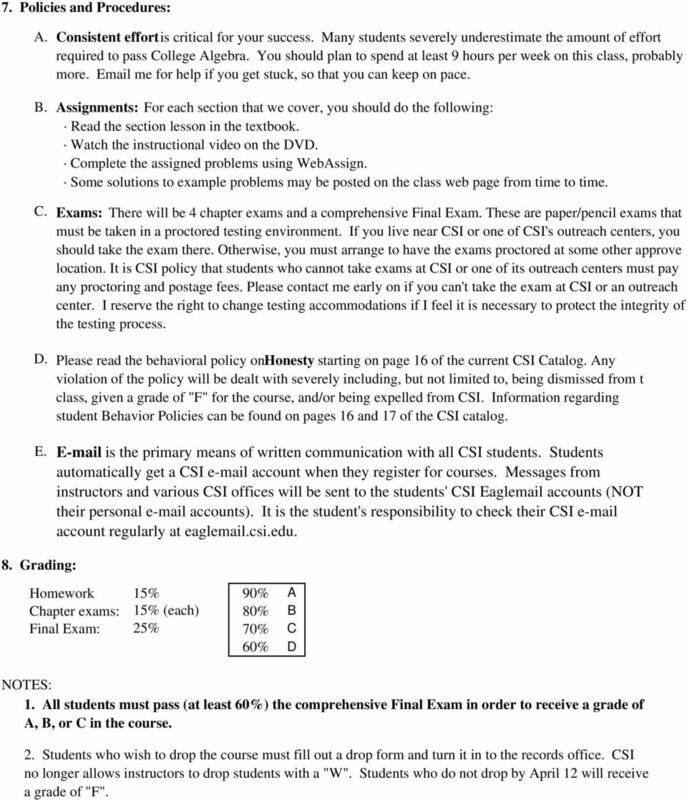 The Final Exam must be taken on or before Monday, May 10. The exam covers all the material covered in the entire course. 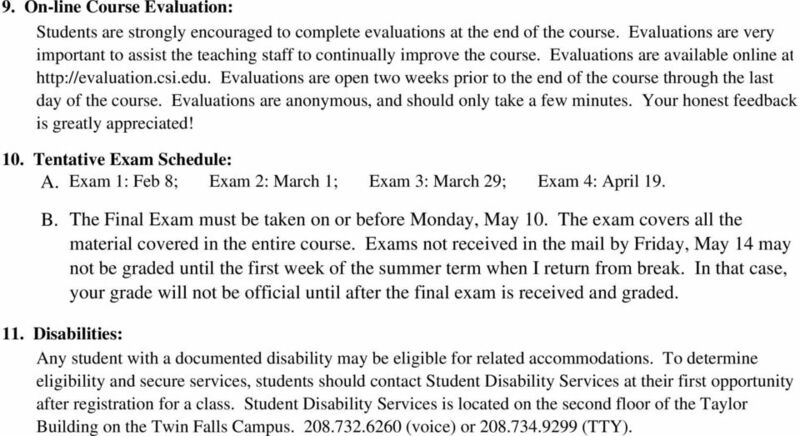 Exams not received in the mail by Friday, May 14 may not be graded until the first week of the summer term when I return from break. In that case, your grade will not be official until after the final exam is received and graded. 11. Disabilities: Any student with a documented disability may be eligible for related accommodations. To determine eligibility and secure services, students should contact Student Disability Services at their first opportunity after registration for a class. Student Disability Services is located on the second floor of the Taylor Building on the Twin Falls Campus (voice) or (TTY).